Well, its over. Okay, not really. There’s still editing, revising, editing, revising, fluffy, editing, revising. With NaNo wrapped for me, I’ll work on other projects, and keep up with this here NaBloPoMo challenge for the rest of the month. Then I think I’ll buy myself a bottle of Japanese Plum Wine and have a breather. Maybe go out for dinner. Some good old BBQ Ribs, or a nice big steak sound good. Though, sometimes going out to dinner is a waste for me. By the time I have my salad and my entree comes, I’m full and have them box up my entire entree. Then again…keeps me from having to cook the next day. I am wondering how many people will hit that 50k or more mark by the time NaNo wraps up. I’ve never really looked at the statistics before. I mean, its a world wide event. I’m really curious as to my local area. I’m part of the forums, I give pep talks, I mail my buddies to cheer them on. I will definitely take part in NaNo again, and be a supporter of it all. I am even sporting my NaNo t-shirt today. I have two. And I pre-ordered my winners shirt when I hit 50k. 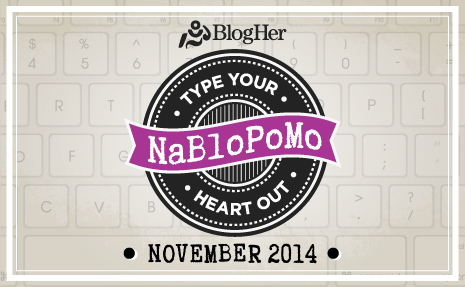 NaBloPoMo has honestly been more of a challenge than NaNo. Coming up with something new to share every day. I really didn’t think I had it in me. I mean, who cares about lil old me and my little ramblings? I don’t want to over-load people with ‘buy my book’ blurbs, its not even available yet. (Look for the link on December 1st, ~wink wink nudge nudge~ I think over promoting my drive people away. Besides, I look at it this way. If people want to buy my book, wouldn’t they want to know me a little? The quirky little woman behind the words? I dunno, my warped reasoning maybe? I’m by far no expert in blogging. This is really my first endeavor. I’m sure things, just like with my writing, will evolve and expand in time. Right now I’m working in like, a safety zone. I dont post too outrage things and the like. I reserve scaring people with my musing for after people start buying my books…HAR! This entry was posted on Thursday, November 20th, 2014 at 3:21 pm	and tagged with horror, Upcoming Book, writing and posted in Blogging, I went Bump, musings, NaNoWriMo. You can follow any responses to this entry through the RSS 2.0 feed. You’re a NaNo rock star, with your pep talks and encouragement! Zoe,you’re a champ! I may participate next year. This year it was impossible for me due to the intensive language classes in the evenings. I wrote less than 10k in the entire month of November. And started the blog in December, so missed the blog challenge too. But I’ll probably join you next year!